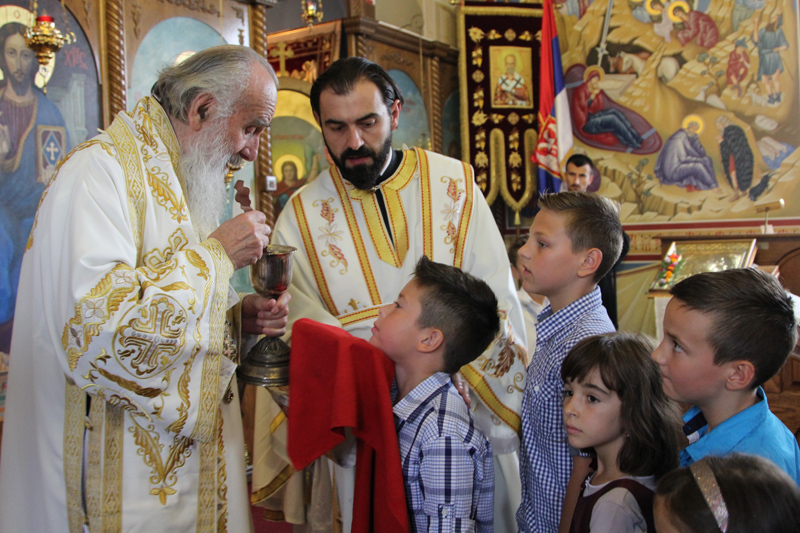 Windsor, Ontario - With God's help the fiftieth anniversary of the St. Demetrios church-school congregation in Windsor was celebrated. 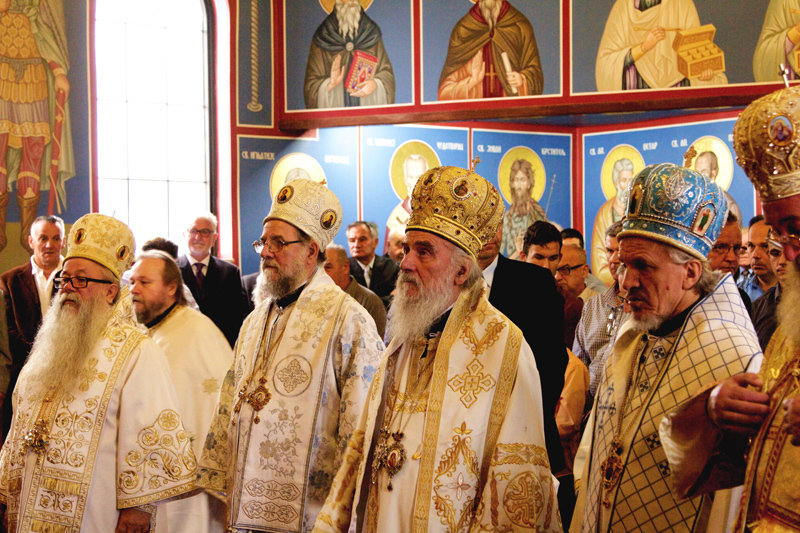 Parishioners, together with the clergy, deacons and readers, welcomed His Holiness Serbian Patriarch Irinej who was accompanied by Bishop Vasilije of Srem, Bishop Longin of New Gracanica and Midwest America, Bishop Hrizostom of Zvornik-Tuzla and the newly elected Bishop Mitrophan of Canada, who on the following day, September18, 2016, will be enthroned in Mississauga as the local bishop of the Diocese of Canada. Preperations for the celebration of the fiftieth parish anniversary have been underway for months. The church board led by the parish priest as well as all the parishioners and church organizations worked day and night in order to make this day all the more special. 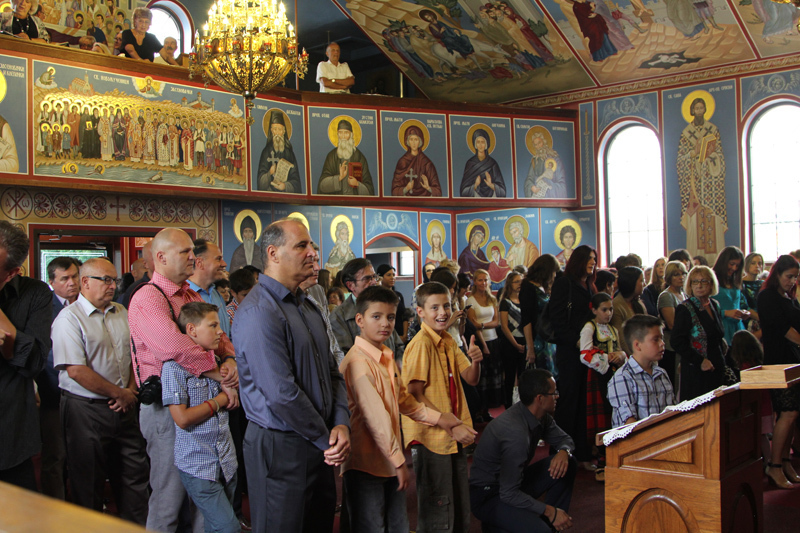 The St. Demetrios parish church was consecrated in 1966 and since then it has served as a place of regular services, where generations are saved through their Holy Serbian Orthodox Church. In the parish there is an active church choir that beautifully sings at every service, the "Majka Jugovic" Kolo Sestara, there is a Church School with 40 children where, apart from the catechism, Serbian language is taught as well as Serbian history. There is also a folklore group "Mlada Srbadija". 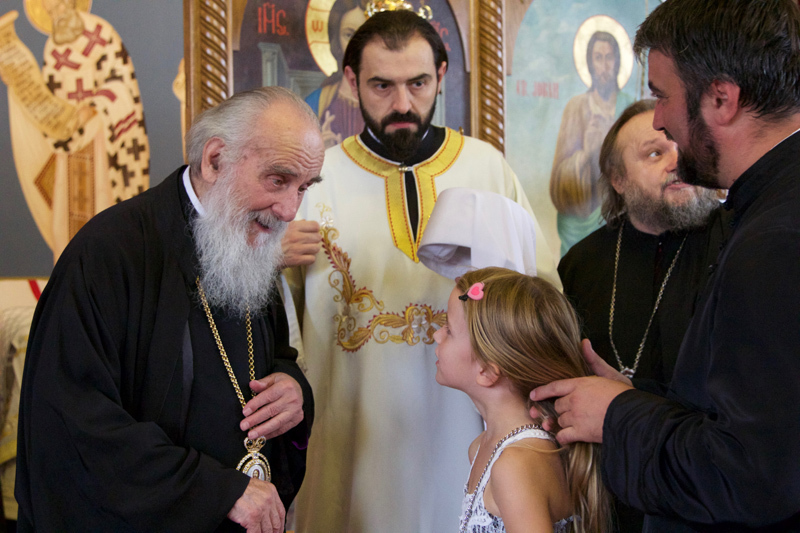 Concelebration with His Holiness were the aforementioned hierarchs together with: V. Rev. Stavrophor Vasilije Tomic, the Episcopal Deputy, V. Rev. Stavrophor Srboljub Jockovic,V. Rev. Stavrophor Miroljub Todorovic,V. Rev. Stavrophor Milan Krstic,V. Rev. Stavrophor Zivko Kajevic,V. Rev. Stavrophor Obrad Filipovic; V. Rev. Milan Jankovic, V. Rev. Jovica Djetkovic, the parish priest, Protodeacon Damjan Bozic and Protodeacon Milovan Gogic, while Fr. Sinisa Milutinovic sang at the chanter's stand and Goran Jaman read the Epistle. The pious faithful partook of holy communion out of two chalices. "There are many martyrs who suffered for Christ's Church....And so, our Russian brothers suffered greatly throughout history and our faithful, not only in Jasenovac, but in many other places, gave their lives for Christ; being innocent, they suffered for their faith. The example of the Elder Vujadin, and Vukasin from Klepac and many others - all of them peacefully accepted the martyr's wreath and gave their life for Christ. They all suffered simply because they were Serbs, because they were Orthodox. But after Golgotha comes the Resurrection, our great Njegos said. 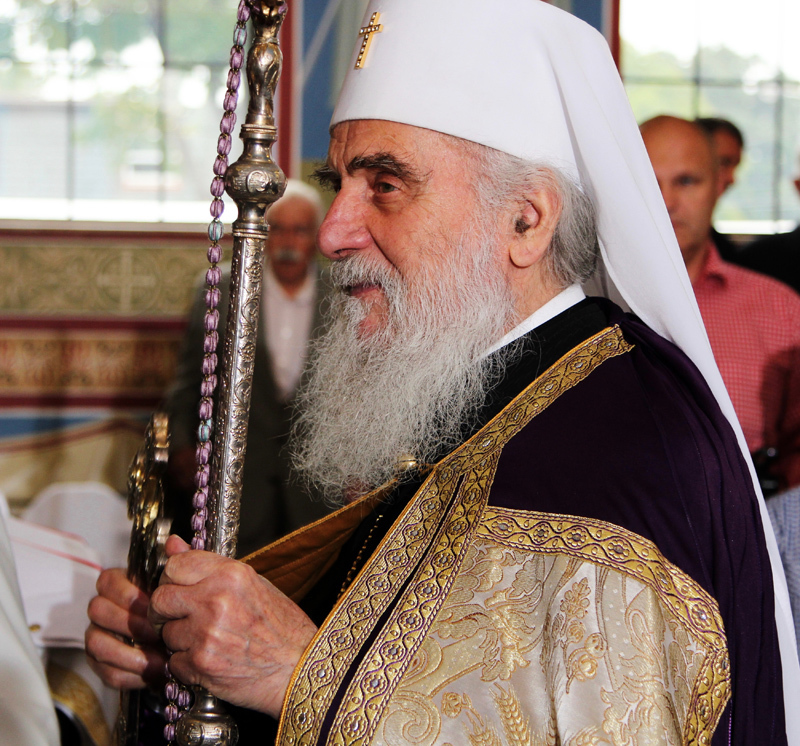 "We come from our martyred Serbia and bring you greetings on this occasion of your fiftieth anniversary. Know that you are not alone here, for we are also with you. The Church is not here to divide but to gather. Some will say: I love God but I hate my brother. However, know that hatred cannot win, it is not love, dear brothers and sisters, since only love can defeat hatred, His Holiness said, among other things. 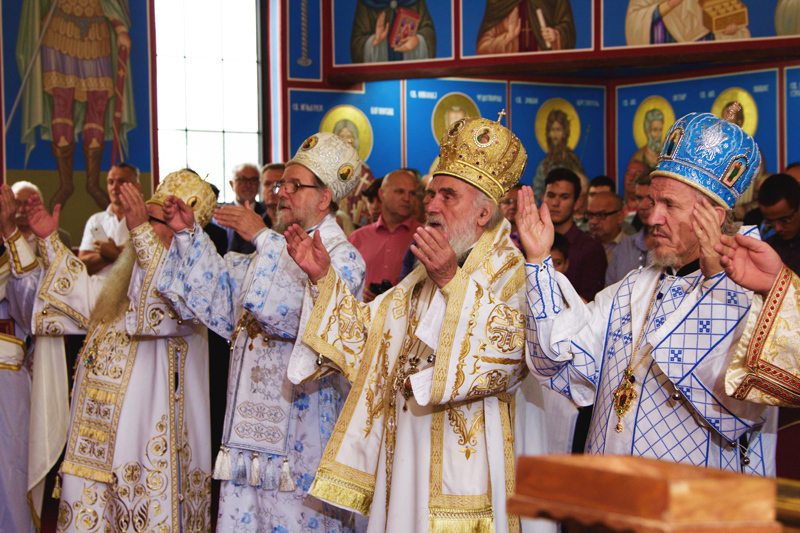 Following the Divine Liturgy a formal academia was prepared in the church hall, in which members of the church board and representatives from the local goverment took part; they greeted the parishioners and congratulated them on their fiftieth anniversary, noting that they too are proud that such individuals are Canadian citizens who preserve their tradition and culture, and show their loyalty to their homeland. Church school children sang a few Serbian songs, two young girls performed works from Serbian composers on the violin and piano, while the "Mlada Srbadija" folklore group performed dances to the enthusiam of the audience. After the program, Fr. 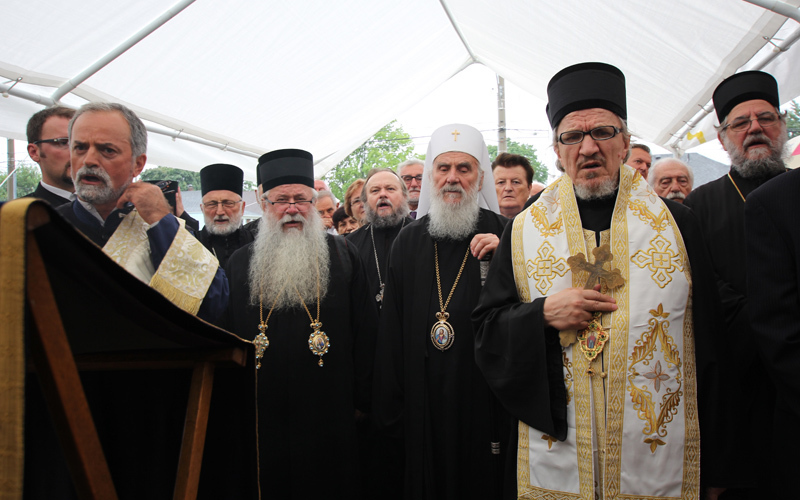 Jovica asked His Holiness, the hierarchs and all the faithful to go in front of the church, under the tent, to serve a Pomen, memorial service, and bless the monument-plate with all the names of the benefactors and founders of this holy church. This was served by Bishop Mitrophan and Protodeacon Milovan Gogic. In continuation Bishop Mitrophan blessed a sundial which functions without any technological aid - the same sundial exists in Monastery Hilandar and a few other places. Following this prayerful gathering all guests were invited in the hall which was prepared for the banquet. The choir sang The Lord's Prayer, the Canadian and Serbian national anthems, and His Holiness blessed the food and drink. The "Majka Jugovic" Kolo Sestara prepared a wonderful meal with all Serbian specialities. 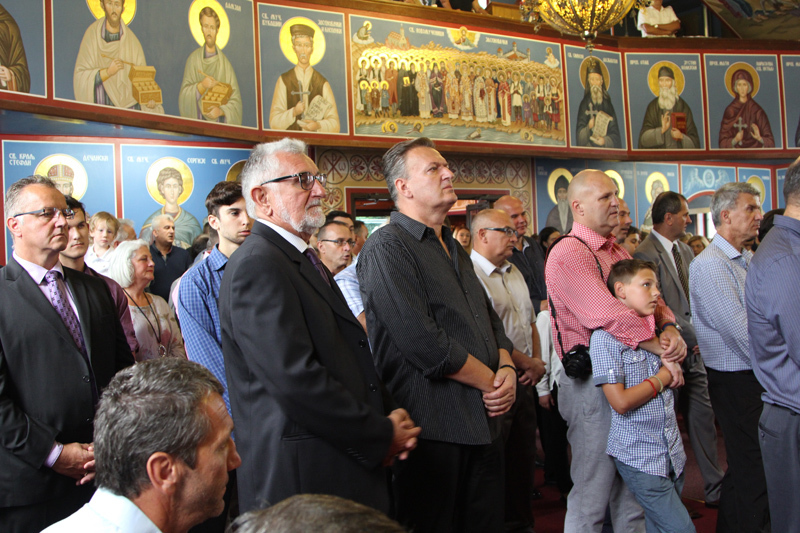 After lunch, Bishop Hrizostom of Zvornik-Tuzla greeted all the faithful and thanked His Holiness and all the hierarchs in attendance, he praised the work of the parish priest, Fr. Jovica, and his parishioners and then greeted all the his former parishioners from the Diocese of Zvornik and Tuzla and Bihac and Petrovac who now live in Windsor.